Forecast: Heavy rain, thunder, lightning till Sunday! 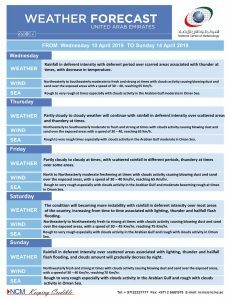 While you might have cuddled up last night, watching the heavy showers and flashes of purple lighting up the sky, this week’s weather forecast has more surprises in store for you. Flash Floods warning has been issued until Sunday. 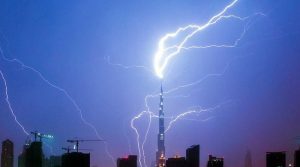 As per the weather forecast, you can expect stormy weather, rainfall and thunder on Friday night in different parts of the UAE and will continue till Sunday. You may feel a sigh of relief with the drop in temperature, but beware; thunder, lightning and even flash flooding are expected this weekend! While you can be in shelter to wade off the heavy downpours expected all day, you need to be cautious of the strong winds causing blowing dust and sand reducing visibility to less than 2km at times. Why is Flash Floods Expected? 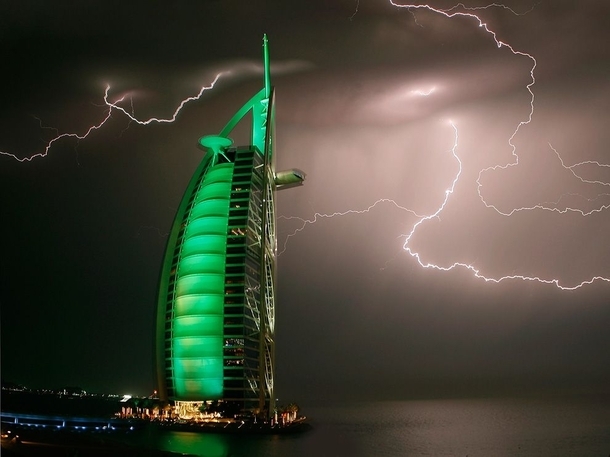 Yes, you can expect heavy downpours causing flash floods in different areas across UAE. The heavy torrents are due to the cloud movement arising from the Red Sea and Africa, as well as south-easterly winds causing a flow of clouds from the southern and central areas of Saudi Arabia. From Tuesday night to Friday, scattered rainfall of different intensities will start from the west coast and gradually extend to internal and Northern areas. According to the NCMS report, rainfall will be accompanied with thunder and lightening at times. As wind will be moderate to fresh and strong at times especially with convective clouds, leading to dust and haze with poor horizontal visibility, Dubai Police has issued an alert urging motorists to drive carefully. It has warned drivers to to exercise caution on the roads, slow down and follow traffic safety rules as inclement weather plagued commuters. In case of very poor visibility due to dust, stop on the right side off the road with warning signs. So better be vigilant during the dust storm, follow safety procedures in such conditions for the safety of all.Also motorists reduce their speed to avoid aquaplaning.